Our friendly instructors have a lot of experience with both the riding and teaching side of skateboarding. Each coach has undergone training, holds a current Working With Children clearance and has completed their First Aid training. Daniel caught the skateboarding bug from an early age and has been riding ever since. He skates a range of terrains including street, ramp and skatepark. He’s also helped many students develop their skill and confidence on a skateboard. His broad experience with both riding and instructing, coupled with a passion for helping students reach their goals, means you’ll be in great hands when you book a Skate Now lesson. Claudia is a passionate skateboarder who began skating from an early age. Initially honing her skills with street and flatland skating, she’s now gained a strong interest in ramps and bowls. 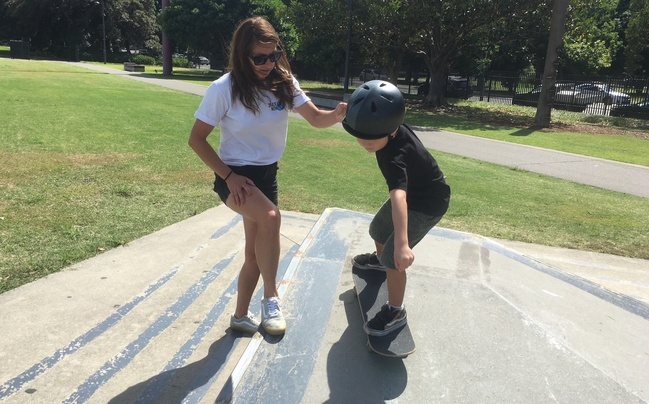 Claudia has a high level of experience hosting children’s events, and has a natural gift for sharing her knowledge of skateboarding and hosting large groups. She also regularly teaches urban dance, and fitness classes and has a great knowledge of sports coaching.